In January, I picked up the new Dell XPS 13 9370 to replace my 4.5-year-old MacBook Pro. It has been a fantastic machine. 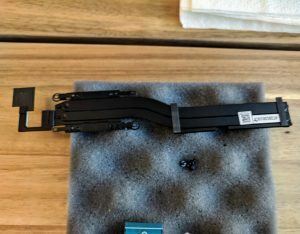 I especially love the single-cable docking solution that Thunderbolt 3 enables. A couple of months ago, however, it took a bath in hot tea. The full mug doused the entire keyboard. I quickly powered it off, flipped it over, patted it dry and put it on fans for 24 hours. I was frankly quite surprised to find that the Dell chimed right back to life when I powered it on. The keyboard must have had some pretty substantial water-proofing to be able to withstand such a direct hit. The spill did leave the keyboard mushy making typing on it a real pain. All of the keys worked, but it was no longer useful for extensive typing. 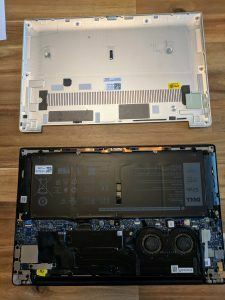 I have replaced laptop keyboards in the past, but this was my first attempt at an extra-thin ultrabook. 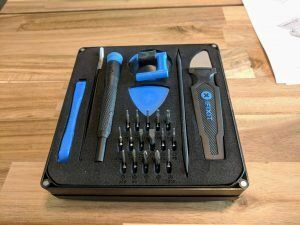 Some models in this form factor are not DIY-repairable. 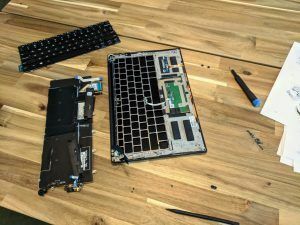 Dell, however, has historically been pretty good about making it possible to open up their devices for simple repairs. Since the 9370 is so new, I could not find the keyboard on the website anywhere, but a parts specialist was able to send me a quote via chat. Dell Outlet had a replacement keyboard available for $55. 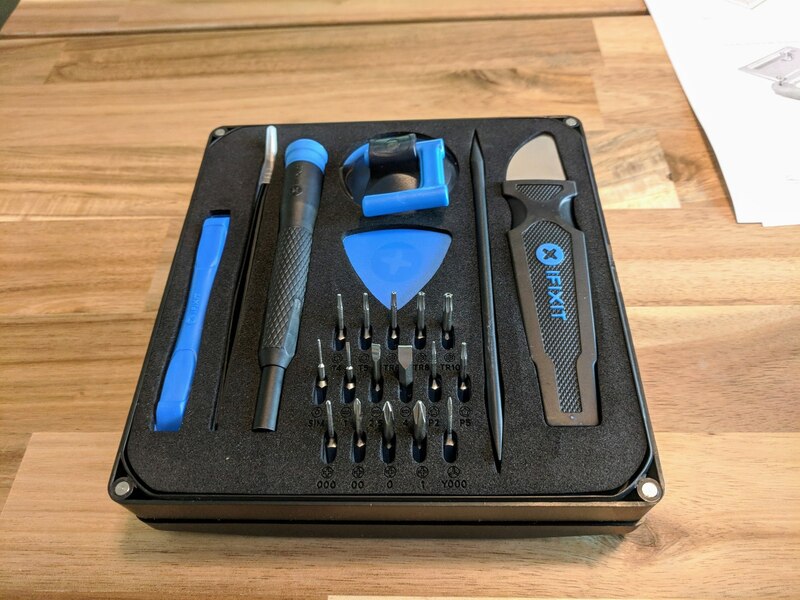 My old, cheap toolkit had also run its course, so I picked up the iFixit Essential Electronics Toolkit set for $20. 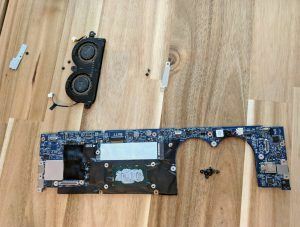 To replace the keyboard of this model, I had to remove just about all of the other components in the base. Thankfully, Dell provides some pretty solid documentation in their Service Manual. Before removing and replacing the keyboard, all of these other components had to be removed. In general, the Service Manual led me through step-by-step in fairly good detail. There were a few difficult patches, though, that I wanted to jot down in case anybody else came across this facing the same dilemma. There was one cable to disconnect from the system board that the Service Manual did not address. This cable turned out to be one of the more difficult cables to reconnect. I am unsure what the cable was for, but all of the system peripherals seem to work so far since I did this work. The manual also did not reference removing the speakers as a prerequisite, but they indeed were. The keyboard was layered under the speakers with the wire connecting the two taped to the back of the keyboard. 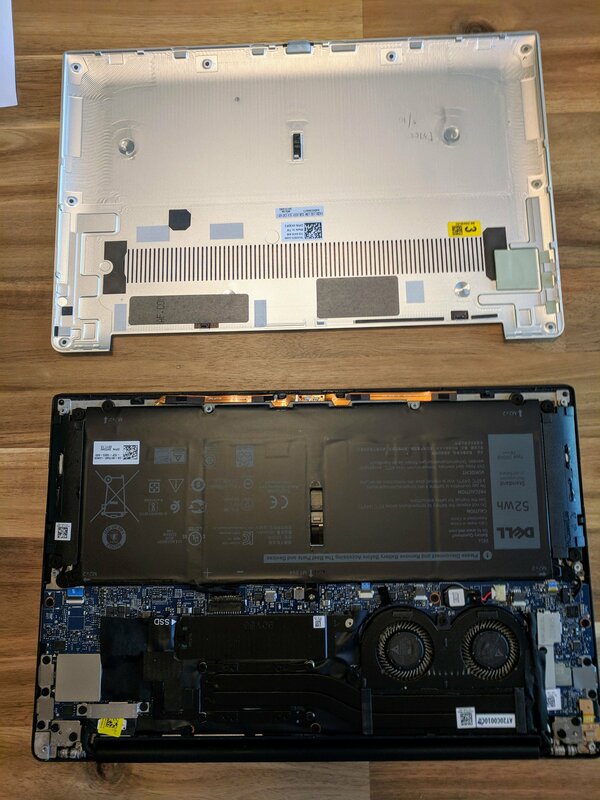 The manual said to “Adhere the thermal pad and foil sticker shipped with the keyboard onto the replacement keyboard.” (Replacing the Keyboard Procedure) Dell Outlet, however, did not include a new thermal pad and sticker, so I attempted to re-apply the originals from the outgoing keyboard. The adhesive seems to have held, but it is stuck very loosely in parts. Lastly, re-connecting the Wi-Fi antenna cables was particularly challenging. They required applying a substantial amount of pressure in a precise location. Tweezers helped. The teardown, replacement, and rebuild took 4.5 hours. I do not recommend applying hot tea to your devices, but its good to know that some manufacturers are making high-quality devices that can withstand some beating and are repairable. 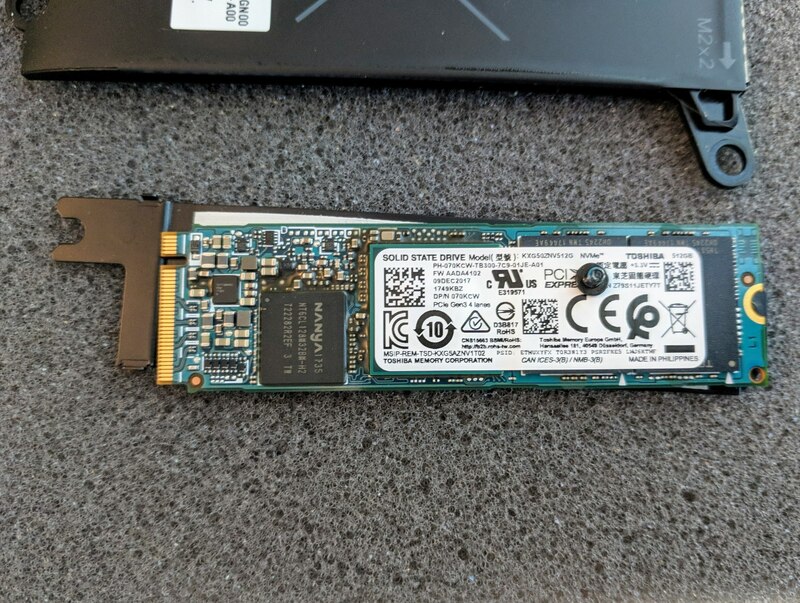 I have a XPS 13 9370 that I bought on eBay for a steal of a deal. 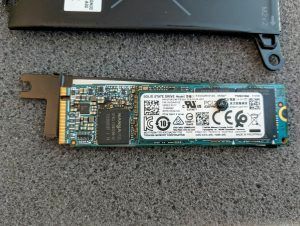 The only thing I had to do was change the SSD (it didn’t matter which size came with it, I was going to change it anyway) and find a fingerprint reader. 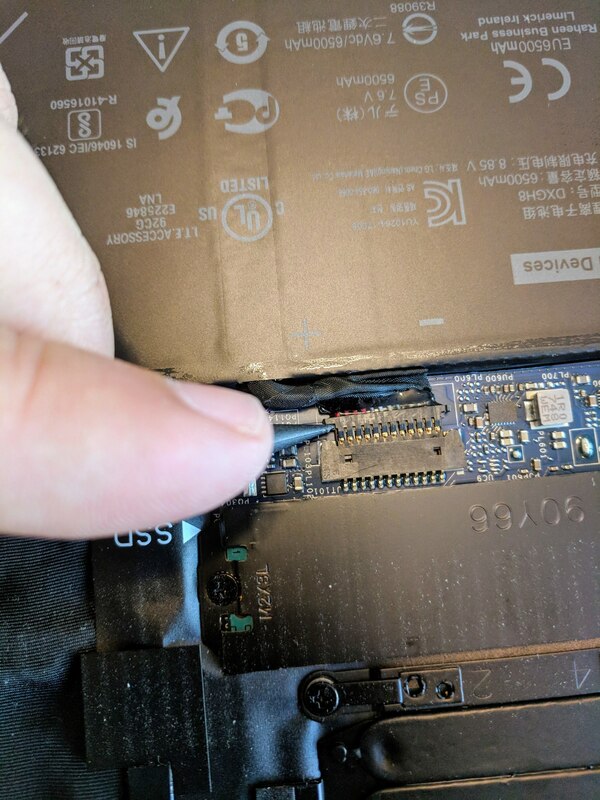 For the life of me, I cannot find the Dell PN for the Fingerprint reader, but I see you took yours apart far enough to get the number, now I cannot see it in your last photo but I am hoping you took more pictures… Did you? Sorry this is so late, for some reason I stopped getting notifications of comments on my blog. 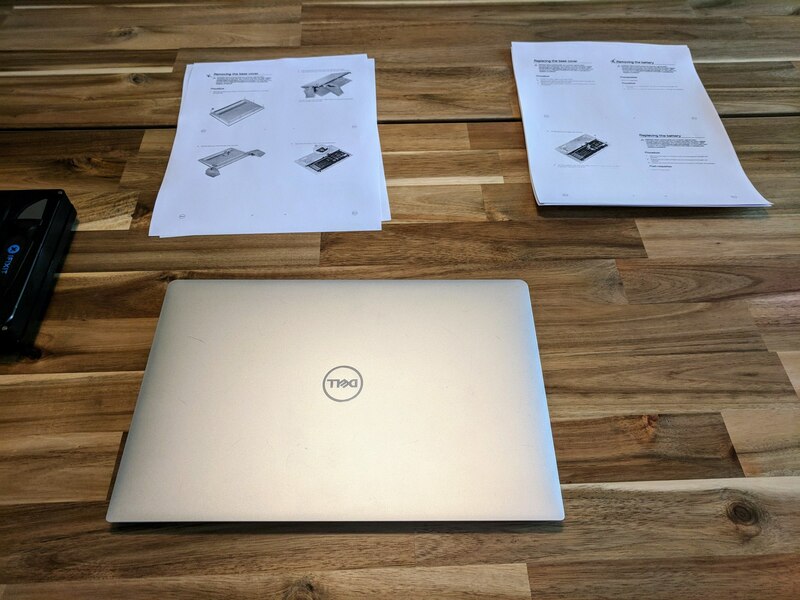 Hey there, I did find the Dell PN for the fingerprint reader and swapped it out. Thank you for keeping an eye out.